When I was in the fourth grade, my class was assigned a project to help us learn about countries other than our own. Novel idea. We each had to pick a country and present reports including all the basic Wikipedia-esque info. To celebrate the end of the project, we picked a native food and brought it in for a class potluck. Eating my very first tamale at the potluck was the first time I remember truly enjoying food. The fresh tamales, with tender masa and spicy pork filling, were completely handmade by my best friend’s Guatemalan grandmother. Those tamales sold me on Guatemala. My choice was Greece, for which I had a particular fascination. While researching their agriculture, I learned that Greeks produce and consume a lot of lemons. So naturally, I brought in lemonade for the potluck. At age 8, lemonade was the only way I consumed lemons, so my assumption was that lemonade was how Greeks ate lemons too. Adorable, no? That fascination with Greece has now come full circle as that is where I’ve now decided to live out my days. Blue water, warm weather, superb food: all the necessities. In preparation for that next great move abroad, whenever it may happen, Greek food frequently makes an appearance in our diet. Many Greek desserts are teeth destroyers dripping with sugar coma wrapped in phyllo dough then dusted with…more sugar. I tend to prefer a more subtle sweetness myself. 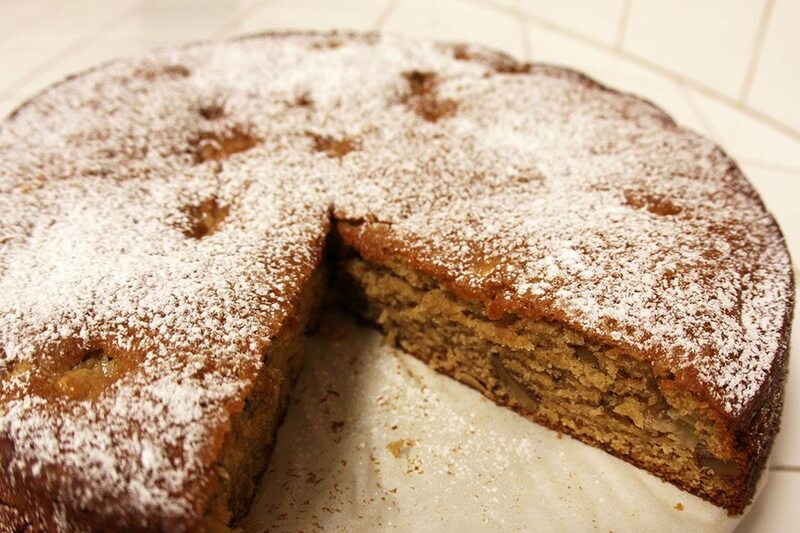 Apple Tahini Cake is a nice alternative to gooey baklava if you aren’t in the mood for an afternoon of teeth brushing. The cake is made with a base of tahini, or ground sesame paste, a common Middle Eastern and Greek ingredient. 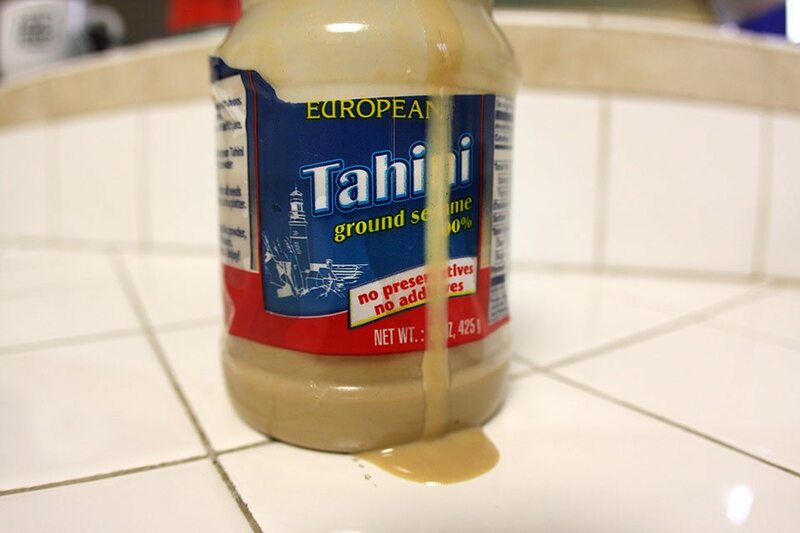 Tahini has a very similar aroma and consistency to peanut butter, but is more intensely flavored. Add in a little walnut and fresh apple. Heaven, party of one? I’ll be the first to admit my surprise at how decadent a cake could be without eggs or butter. Shocking, I know. But if you’ve every found yourself looking for a vegan-friendly dessert, give this one a try. Preheat oven to 350F (175C). Line 10 1/2″ spring form pan or 9″ x 12″ casserole with parchment paper. Grease pan with butter or cooking spray (if going vegan). With mixer, beat tahini and slowly add sugar. Stir together cognac and baking soda to dissolve. Add to tahini and mix to combine. 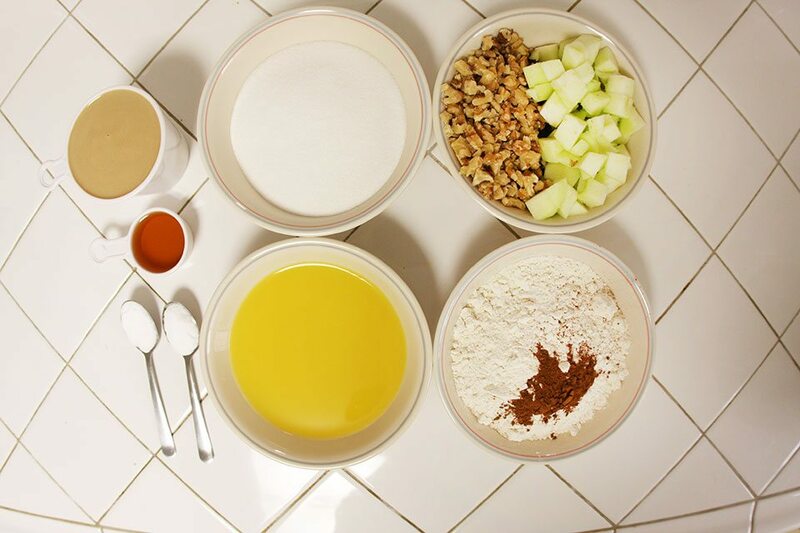 In separate bowl, combine flour, cinnamon, walnuts and diced apple. Toss together. 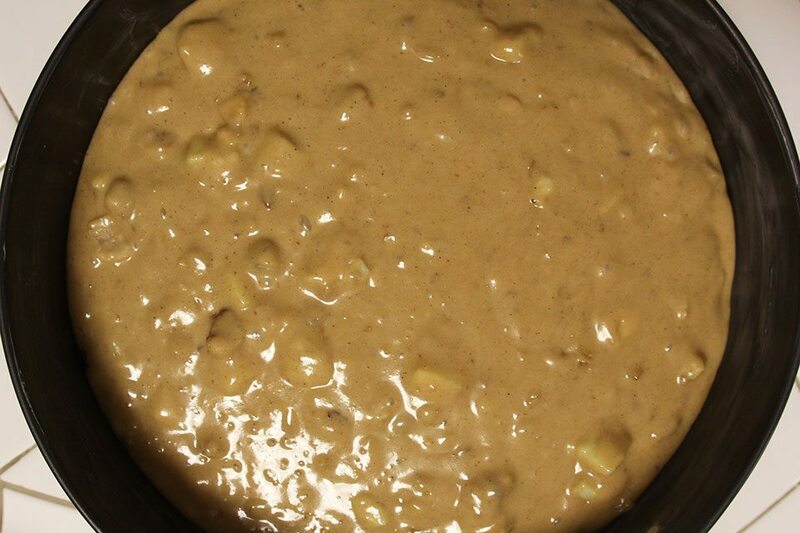 Add 1/3 of the flour/nut mix to tahini and mix. Add 1/2 the OJ then mix. Add another 1/3 flour, then other half OJ. Finish with remaining flour and mix just until combined. Batter will be thick. Pour batter into pan and even out. Bake for 45m until cake is a dark chestnut color and set. Remove from oven and dust with powdered sugar. Let cake cool in pan. Traditionally, the cake is cut into squares or diamonds. Whichever shape you choose, it will be just as delicious I promise. Will try this recipe! AND I remember this assignment in 4th grade! I think my country was Germany and I made cheese sandwiches. What was I thinking?! Michelle, definitely let me know what you think!Perhaps you used a German cheese??? Will do! Haha, I wish I was that sophisticated or smart in 4th grade. I used cheddar cheese and white bread. Blech! Oh well, you live and you learn. Question – for the 9 x 12 in casserole dish, I have a glass one – is that okay?Also, do I really need to use parchment paper? I've never used one and don't have it handy. Any substitutes for it? A glass dish will work just fine. Just keep an eye on the cake as the baking time will be +5-10 minutes when using glass. Still check the cake at 45m.A good substitute is wax paper. Just be sure to grease it and that there is not much overhang or the wax paper will burn. Another substitute would be foil. That way you can lift the cake out when it is cool to cut. Hope this helps! 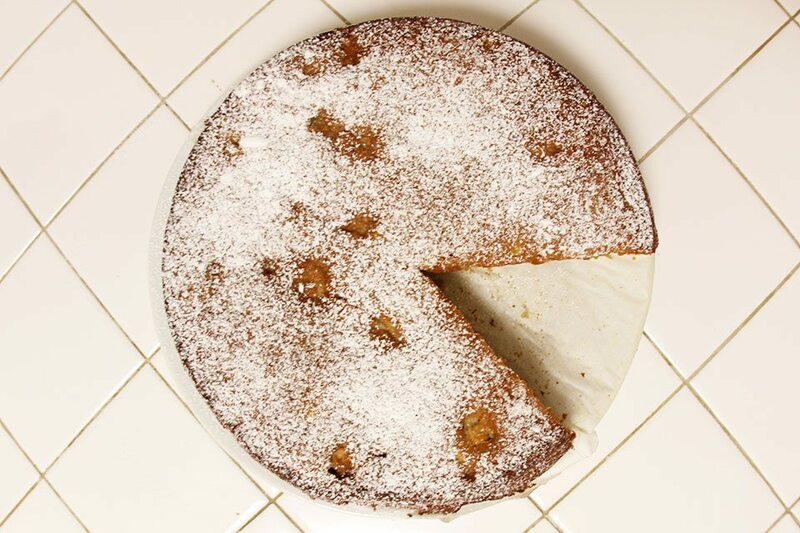 More questions :-)Can I substitute almond flour for this cake? Also, is baking soda okay to use to make it gluten-free? Any tips will help! I'm not much of a baker.